Davidoff Cool Water Summer Seas for Women is a bright & feminine floral-fruity. 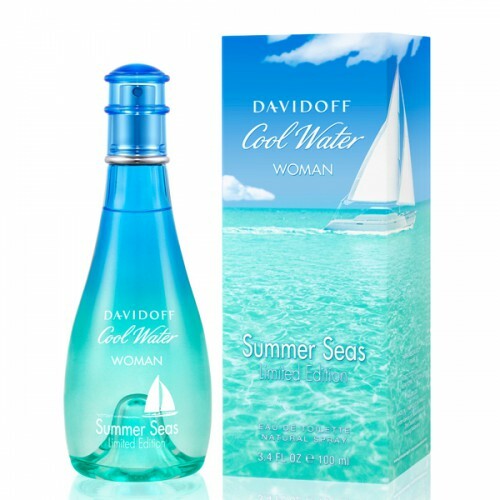 Davidoff Cool Water Summer Seas for Women 100ml. Eau De Toilette is a bright, sparkling clean cool floral-fruity fragrance for women, released a popular fashion brand Davidoff for the summer season 2015. The aroma is perfume Flanker unreleased Water Sea, which gained gentle feminine notes and a special lightness, almost ephemeral. Delicate aroma begins to sound with fresh, tantalizing notes of ripe, honeyed melon. Then it emerges through touching, magical scent of lily of the valley bouquet whole. Flower chord sounds gently and delicately, and leaves behind a rich and sensual trail of delicate shades of aromatic orris. This aromatic composition with its delicate, refreshing scent perfect for a hot summer when you do not want sharp and thick aroma, and required light refreshing aromatic smoke, which brings a sense of purity and coolness. Davidoff Cool Water Woman Summer Seas - feminine, floral-fruity fragrance created especially for the summer season 2015. The fragrance opens subtle notes of delicious melons, that in conjunction with the lily of the valley and the base of sensuous violet gives a divine fragrance. Notes: melon, lily of the valley, orris root.